The Farmory is the answer to an urban food desert in downtown Green Bay. The USDA defines an urban food desert as an area where residents are anywhere from a half-mile to a mile away from a grocery store that stocks fresh produce. For those without cars or other reliable transportation, a mile can mean the difference between fresh and packaged food! Furthermore, in Brown County at large, over half of all households with children are food insecure, meaning that they find it difficult to access enough food to feed their families—especially fresh produce and other components of balanced meals. We want to be the change this community needs. First, we’ll provide fresh produce and fish through our cyclical, sustainable growing setup. This food will find a home back in the same community that grows it, showing up in local restaurants, schools, and healthcare institutions. Buying local shrinks the environmental impact of mass transport and shipping, but it also means produce arrives fresher—and tastier! Second, and more importantly, The Farmory is committed to community outreach and education. If residents aren’t nearby a local grocery store of their own, the fastest, cheapest, and most sustainable option is to grow some of their own food! The Farmory aims to equip local residents with the knowledge, equipment, and experience they need to grow their own food, whether it’s in kitchens, community gardens, or backyard hoophouses (these are small structures that allow us to grow food year-round, even in Wisconsin!). Whether residents learn these important skills by volunteering at The Farmory’s own grow site, or by attending a seminar, workshop, or class offered at The Farmory, they can take the knowledge they gain and implement direct changes within their own families and households. 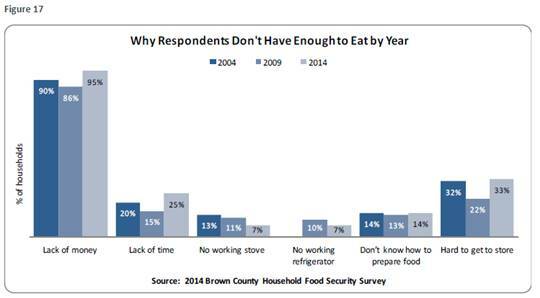 51% of households with children were food insecure in contrast to 43% of adult-only households. The large majority of households were feeding children a few kinds of low-cost foods and could not afford to feed them balanced meals. Two in five households with children reported that their children were not eating enough. 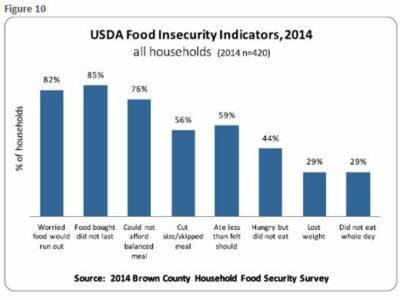 *All the above facts and figures were found in the 2016 “Food Insecurity, Barriers, and Possible Solutions” report.